Alicia Munnell wants to make one thing clear. Social Security is not going bankrupt. The program that the economist calls “the most valuable component of our retirement system” is a sustainable system and can be fixed. America has just been avoiding the hard choices it has to make if it wants to keep Social Security around for future generations. Munnell, who worked at the Federal Reserve Bank of Boston for 20 years, the Treasury Department for two years during the Clinton administration 1 , and served on a U.S. Social Security Advisory Board in 2015, is director of the Center for Retirement Research at Boston College. She has parsed just about every argument for how to reset Social Security’s finances. In a recent conversation and paper, Munnell, 74, laid out the stark choices Americans face, and the solutions suggested by two diametrically opposed pieces of legislation. We all know Social Security has long-term cash-flow issues. How would you describe the challenge? Munnell: It’s a very simple system. It’s not like the health-care system, where you have insurance companies and doctors and patients. This is money in, money out. The recent Social Security trustee’s report said the same exact thing it’s said almost every year since 1992 or 1993. We have a deficit—it’s a little bigger now than in the past—that’s equivalent to 2 percent to 3 percent of taxable payrolls, and we need to fix it. Every year the actuaries tell us there’s a deficit; every year as a nation we do nothing. It’s very easy to put off making changes for something that won’t happen. You really won’t see anything until the trust fund actually is exhausted in 2034. At that point, benefits have to be cut or revenue increased, because the system is not allowed to pay out money that it does not have. By the way, when people talk about how the Social Security deficit will lead to big increases in the budget deficit, well, Social Security can’t run a deficit. When people say that, either they don’t understand how the law works or are trying to create alarm about the system. One misperception about Social Security is that it should be enough to live on, which was never really the intent. How much income does it actually replace for workers? 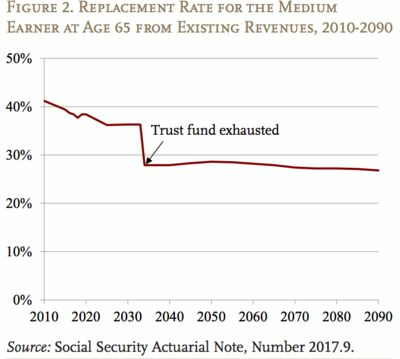 The current level of tax revenues coming in mean that the replacement rate—benefits relative to preretirement earnings—would drop from 36 percent for the typical 65-year-old worker right before the trust fund is exhausted to about 27 percent by 2070. That’s a level we last saw in the 1950s. Right now, the replacement rate is already set to decrease from 39 percent to 36 percent for those claiming Social Security benefits at age 65. That’s because of the gradual increase in full retirement age, from 65 to 67, that was part of the legislation in 1983. You describe two proposals out there as good “bookends” to consider when looking at ways to get rid of the deficit facing Social Security. I like the proposals as bookends because they are so different, they don’t compromise at all. One is all on the benefit side, just big benefit cuts. The other says it would enhance benefits a little and make big tax increases. And those are the two ways to go. They highlight the notion that we should really decide politically—and I don’t know quite how we do this—what share of the solution Americans want in benefit cuts, and what share they want in tax increases. It’s not really arguing about the specific provisions—should we change the inflation indexing to the Consumer Price Index for the Elderly, the CPI –E [an inflation measure geared to rising costs faced by the elderly, such as medical expenses]. The big question: Is this program important enough to people that we as a nation want to pay up and maintain current benefit levels, or are people willing to split the reform between benefit cuts and tax increases somehow. Surveys say that Americans want—and this is my instinct—to pretty much maintain current benefit levels. When I look at how much money, or how little money, people have in 401(k) plans, I just don’t see any other sources of retirement income out there. So I’d argue for fixing it on the revenue side. But I do believe in democracy, and if the American people writ large want to do it on the other side, in benefit cuts, we should do it. 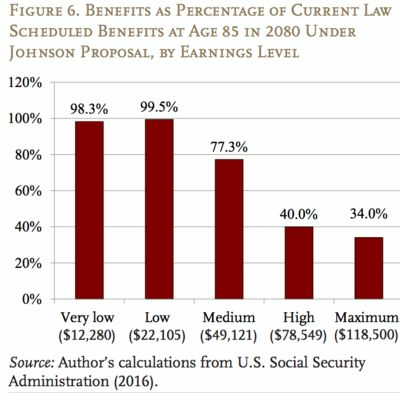 The first proposal you analyzed in a recent paper was legislation proposed last year by Representative Sam Johnson, a Republican from Texas who is chairman of the House Ways and Means Social Security Subcommittee. What does he propose? What would the impact of that be on average Americans? I looked at the ratio of proposed to current benefits at different points on the earnings scale. Since doing away with COLAs has a bigger impact as retirees age, I looked at individuals who were 85 years-old. It has no impact on the benefits of lower earners. But medium earners—which I calculate as having an income of $49,121—would see benefits cut to 77 percent of what they would get under current law. [That would be for someone born in 1995, turning 85 in 2080.] Those making $118,500 would get 34 percent of what they would get under today’s benefit schedule. What does the other proposal, from Representative John Larson, the Connecticut Democrat who is the ranking member of the House Ways and Means Social Security Subcommittee, suggest? It would also use a different measure of inflation when adjusting benefits—the CPI-E. This rises faster than the inflation measure used now, the CPI-W, the CPI for Urban Wage Earners and Clerical Workers. The income threshold for the taxation of Social Security benefits would be raised. [The threshold at which a portion of one’s Social Security benefit gets taxed hasn’t been adjusted since 1984. It is $25,000 for singles and $32,000 for married couples.] Larson would raise it to $50,000 for singles and $100,000 for marrieds. His proposal would also increase the “special minimum benefit” that goes to long-term low earners or people with sporadic work histories. Are there proposals out there now that advocate for a middle ground between the two proposals? No. But you could do it. You just raise payroll taxes by half as much and cuts by half as much. There are infinite ways of doing it, and no new ideas particularly. This is a solvable problem. We can’t solve other things, but this should be easy. Oregonians in the individual insurance market should brace themselves for yet another year of double-digit rate hikes. Eight insurance companies are seeking increases ranging from 6.9 percent to 21.8 percent over 2017. The companies had until Tuesday to submit their 2018 rate requests with the Oregon Insurance Commission. Some consumers will also face dwindling choices for insurance. In Lane, Lincoln and Tillamook counties, just two insurance companies applied to do business in the individual market. State regulators will consider the rate requests and negotiate final numbers by July. The ratemaking process always requires a good deal of educated guesswork about the health and likely medical claims of the customers. It's even more fraught with uncertainty this year as President Donald Trump and a Republican controlled Congress hope to dismantle the Affordable Care Act, the Obama-era legislation that radically changed the insurance market. While Obamacare has been hailed for extending medical coverage to millions of additional Americans, it's been far from a smooth rollout. In Oregon, medical claims were far higher than expected, and the federal programs reneged on financial assistance to some insurance companies, like Moda Health of Portland, that were counting on it. Some insurers have suffered big losses. Some have folded and others have exited the state or certain regions of the state. "We continue to be concerned about the level of choice for Oregonians across the state," said Patrick Allen, DCBS director. "In the coming weeks, we will be exploring our options to ensure all Oregonians have access to plans that fit their needs." Oregonians who get their coverage through their employers have been relatively lightly impacted by the Affordable Care Act. In the newly filed 2018 rate requests, companies offering so-called "small-group" policies are seeking rate hikes from 2 percent to 8.5 percent. Those in the individual market were not so lucky. Premiums for an individual policy on average jumped 23 percent in 2016 and 27 percent in 2017. Individual policies will likely increase in price again in 2018. Of Oregon's big four insurers: Kaiser Foundation Health Plan of the Northwest wants a 12.4 percent hike, Moda Health Plan is proposing a 13.1 percent increase, Regence Blue Cross Blue Shield of Oregon is asking for 18.7 percent and Providence Health Plan wants 20.7 percent. Atrios Health Plan submitted the biggest rate increase proposal at 21.8 percent over last year. Starting Monday, May 22, Oregonians will be able to search rate filings and submit comments at oregonhealthrates.org. It's unclear what will happen if Republicans in Washington succeed in killing Obamacare. They claim the repeal bill that passed the House last month will give Americans more choice. Critics say it will result in millions of Americans losing health care coverage. This means that if a disaster loss occurs in 2017, the taxpayer doesn’t need to wait until the end of the year to claim the loss. They can instead choose to claim it on their 2016 return. Claiming a disaster loss on the prior year's return may result in a lower tax for that year, often producing a refund.